by Dr. Robert Larson, professor of history at Lycoming College and a member of St. Luke Church. The story of St. Luke Evangelical Lutheran Church begins with the congregation of St. Paul’s Lutheran Church in downtown Williamsport. There, on Sunday, August 31, 1890, the members of St. Paul’s took it upon themselves to extend their work for the Lord by establishing a mission at the corner of Brandon Avenue and Elmira Street in the newly developing area of Vallamont in what was then the northern edge of the city. Because it was already burdened with the debt of its own church, completed only twelve years before, it did not have the money to finance this new project and so the original St. Luke was supported by individual members of St. Paul’s, particularly the Heilman brothers. They offered to advance without interest the money for a chapel and wait for payment until the church could repay them. The cost of the lot was $694 and that of the chapel was $1,782. On May 17, 1891, a Sunday School was organized at St. Luke’s Chapel with Mr. A.H. Heilman as Superintendent. The Rev. H.Q. Shadle, Assistant Pastor of St. Paul’s Church, was instrumental in the early work of the congregation and began regular supply work in November 1896 with the hope of formally organizing a congregation at St. Luke’s by Easter of the following year. Unfortunately, Pastor Shadle died before the work could be completed, but his groundwork bore fruit when on May 23, 1897 St. Luke’s Evangelical Lutheran Church was formally organized with thirteen members. Those charter members where Mr. and Mrs. C.E. Harding, Mr. and Mrs. J.G. Mayer, Mr. and Mrs. H.R. Homan, Mr. and Mrs. W.M. Irvin, Mrs. Mellie J. Ernest, Miss Lilian Frantz and Miss Elizabeth Frantz. At the same time, a constitution was adopted and a Church Council elected. The following Sunday, the Chapel was dedicated. The first years of St. Luke were undoubtedly made more difficult by the fact that the early pastors served only short terms. The Rev. W.A. Trostle became the full-time pastor in August 1897. He served until April 1899. From June 1899 until February 1900, the Rev. W.B. Lahr served as pastor, to be followed by the Rev. S.P. Hughes from May 1900 until May 1901. Nonetheless, the efforts of these early pastors must have met with success as the church membership grew from the original thirteen to ninety-seven by the latter date. In February 1901, the Rev. I. Hess Wagner began his pastorate, which lasted until February 1909. Under his leadership, St. Luke’s experiences considerable growth and development. In May 1905, St. Luke’s became a self-supporting congregation, ending its status as a mission of St. Paul’s, and the deed to the property was turned over to the members of St. Luke’s. The new congregation was formally incorporated the following September. Under the Rev. Wagner’s leadership the Christian Endeavor, later known as the Luther League, was organized and the size of the congregation grew to 182 members. On June 1, 1909, the Rev. M. Hadwin Fischer, Ph. D. was installed as Pastor of St. Luke’s. Earlier histories of the church describe him as an energetic and talented leader, who brought rapid growth to the congregation and expansion of its programs. An increase in attendance soon made the size of the original chapel inadequate and in February 1910 the congregation decided to build a new chapel on the lot adjacent to the existing structure. 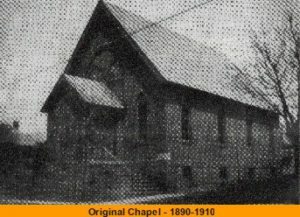 Work has begun on April 27 and the new chapel was dedicated early in 1911. The original chapel was then renovated to become the parsonage. The new facilities enabled St. Luke’s to provide a wider variety of activities than hitherto possible. The basement of the new chapel was used as a gymnasium, the additional space available as reading and game rooms. The church became a community center for the neighborhood and was busy several nights each week. In addition, the Rev. 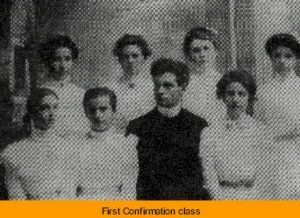 Fischer led in the establishment of a variety of important church organizations, including the Women’s Missionary Society, the Ladies’ Council, Boy Scouts, Girl Reserves, Vallamont Private Kindergarten and the Inter-denominational School. There was also a congregational orchestra which played for most social occasions, a male chorus and an active men’s organization. Early in 1922, the Rev. Fischer was called to be the first professor of Religious Education at the Lutheran Theological Seminary in Gettysburg. Following a search, the Rev. Harry W. Miller came to St. Luke’s on May 1, 1922. The membership of the church at that time was 300. To meet its growing needs, the church found it necessary to expand its facilities once again. 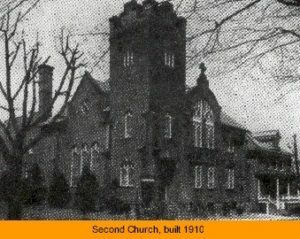 Since the mortgage for the new church was paid off in May 1924, the church was able to build a parish house to accommodate the rapidly growing Sunday school. At a congregational meeting on March 21, 1926, the construction was approved at a cost of $25,000 and the new structure was dedicated on November 14 of that year. Again the church had to borrow the money, but this was paid off in July 1941. Pastor Miller’s leadership left an indelible impression on the congregation. He served for thirty-four years during which time the church grew in size and strength. The educational building erected under his leadership is early evidence of the church’s commitment to education, fellowship and social service. In May, 1934, for example, Cub Scout Pack 12 was established as one of the first packs in Lycoming County. Pastor Miller retired in 1956 and in March 1957 The Rev. Francis R. Bell accepted a call to St. Luke. He and Mrs. Bell – known to everyone as Donna – quickly won the hearts of the congregation. In addition, Pastor Bell soon became involved in many local activities outside the church, which earned him a prominent place in the Williamsport community. By 1960, he was already serving as a member of or on the board of sixteen community organizations. In the meantime, it became apparent that in order to continue to meet the challenges of the times the facilities of St. Luke would have to expand once again. In 1960, a building study committee under W.G. Yoas began to examine the needs of the church in conjunction with the city’s urban renewal plans and in May 1961 the congregation adopted a “Program for Tomorrow”. At a special meeting on November 14, 1961, the members of St. Luke made the difficult decision to leave their site of almost seventy years and move to the present location. There were many solid reasons for this decision: the amount of land available in their location was limited and, because the neighborhood of the church had become built up, very expensive; parking was also a significant problem and bound to become worse rather than better in the future. Moreover, the new location at the corner of Market Street, Grampian Boulevard and Bloomingrove Road offered many advantages. It was on a main avenue of traffic and at a well-known site. It was also in an area where growth was expected and would provide room for the church to expand. Nonetheless, the decision to move was not easy, and it took the full Christian spirit of all members to pull together to make the difficult choice. In 1963 a capital funds campaign resulted in $82,500 in pledges and gifts over the next three years. In June 1964, the congregation approved preliminary plans for the new structure and authorized the church council to proceed to have working drawings, specifications, and estimates drawn up. Ground was broken on Sunday, July 17, 1966 and the cornerstone laid the following October 30. The structure was designed by Harold E. Wagoner, a noted church architect from Philadelphia and built by the George Roller Company of Williamsport. The total cost, including land, furnishings, organ, et. was over half a million dollars. On June 18, 1967, Pastor Bell and the Church Council turned over the keys of the church on Elmiria Street to the congregation of Trinity Gospel Church and then led the members of St. Luke on a march to the new church for their first worship service there. The service of dedication was held on September 10, 1967. At the new site and with the new facilities, St. Luke’s experienced rapid growth and by the time of its seventy-fifth anniversary in 1972 numbered 575 active members. This necessitated an increase in staff and in 1970, a part-time director of Christian Education, Mrs. George Nesbit was added. In 1972 a part-time director of Youth Ministy, John M. Good was added. On September 28, 1975, the Rev. James B. Huffman was installed as Assistant Pastor. Two years later he left for another congregation and the Rev. Charles Coates became Assistant Pastor on a part-time basis. On January 21, 1968 in accordance with the recommendation of the Central Pennsylvania Synod, the possessive “s” was dropped from the name and the congregation was henceforth known as St. Luke Lutheran Church. On November 3, 1980, the mortgage on the new church was burned. In November 1983, the Congregation took another major step forward in enhancing its worship when it voted to purchase a new pipe organ from the L.A. Carlson Company. The tonal design of the new instrument was based on the magnificent pipe organs built in northern Germany in the seventeenth century, many of which are still in service, and was a true work of a art. It was specifically designed by Mr. Carlson for the nave of St. Luke and consists of 2,103 pipes ranging in size from sixteen feet to one and a half inches. All of the pipes were crafted in Holland. The total cost of $147,145 was willingly born by the members of St. Luke in a special fund drive separate from normal expenses. Installation of the organ began in 1985 and, after some unavoidable delays, a grand inaugural recital was held on April 13, 1986 with a performance by Dr. Susan Hegberg of Susquehanna University. On January 29, 1989, the note for the final debt for the organ was burned. Pastor Bell retired on December 31, 1983 after twenty-six years as Pastor. His tenure was noted for his outstanding work in the community of Williamsport as well as his leadership in the parish. This service was recognized by the awards he received: in 1967, the Brotherhood Award from the National Conference of Christians and Jews; in 1971, an honorary Doctor of Divinity degree from his alma mater, Gettysburg College; in 1979, the Bethune Douglas Award; and in 1981, the first Ecumenical Service Award from the United Churches of Lycoming County. His retirement proved to be short-lived, however, and in 1990 he assumed the duties of Assistant Pastor on a part-time basis. The Rev. Coates resigned as Assistant Pastor concurrent with Bell’s retirement, and on May 20, 1984, the Rev. Steven E. Caler became pastor, serving until January 31, 1988. In May of that year, Pastor Coates returned to St. Luke to become the tenth pastor in the history of the congregation. During this time, the members of St. Luke began to reach out to those in need in a more organized way. They established a Latchkey program for neighborhood children, the Love Committee to help members with short-term emergencies, a, agreement with a taxi service to provide transportation to church services for the elderly, participated in Habitat for Humanity and from 1990 until it was dissolved for lack of need in 1992, participated in the United Churches of Lycoming County Interfaith Hospitality Network to assist the homeless. The church also supported groups such as Narcotics Anonymous by providing space in which they could hold their meetings. St. Luke youth did their share by participating in the Adopt-a-Highway program among other activities. Special efforts were also begun during this period to involve the youngest members of St. Luke more directly in the life of the church. K.I.C.K. – Kid’s in Christ’s Kingdom – was established in 1993 to provide social activities for children in the fifth grade and below, and Pastor Coates instituted regular semi-monthly children’s sermons during the main worship service on Sunday morning. The congregation took a major step forward in the area of stewardship in 1989 with the establishment of the St. Luke Fund. Comprised of bequests and gifts given to the church, the fund was established to provide grants to causes near and far “that further the ministry of Jesus Christ in the world” and as a source for special projects within the congregation. As of the end of 1996, the fund had distributed over $130,000 to various church and community activities and $75,000 to help with the new construction costs at the church. By 1991 it was apparent that the activities of the members of St. Luke had once again outgrown the physical capacity of the church building. A new study was undertaken to determine exactly what was required, and in May of that year a “wish list” was drawn up with each project listed in order of importance. At the top of the list was the need for defined classrooms to be used exclusively for Sunday Church School, but other major projects were also seen necessary. Among the most important were the need for additional space for Christian education and music ministry, social and fellowship activities and church administration. The firm of Treby-Howard-Philips of Allentown was contracted to draw up specific plans to meet these needs. In the spring of 1994 the Congregation approved the expansion plans and construction began the following summer. On October 1, 1995 a service of dedication for the expanded and renovated facilities was held. At that time, the social hall was named in honor of Pastor and Donna Bell. The most recent outreach activities of St. Luke have extended it into new areas of ministry. In 1996, Don and Millie Swartz established the Richard E. Swartz Memorial Scholarship Fund to provide grants to members of St. Luke who are pursuing careers in music, education and church vocations. Also, in the spring of 1997, the church council approved the establishment of the Pre-School at St. Luke as a community service open to all families in the area. Classes commenced in the fall of 1997. As the members of St. Luke enter the second century of mission, they are ever mindful of the promise and hope granted to them by the victory of Christ over death. Since the day the cornerstone of the first St. Luke Church was laid, the Gospel of Christ remains their byword, or, as the centennial motto expresses it: “Good News Unchanged”.